A Life of Sugar and Spice: Happy Day Before Thanksgiving! 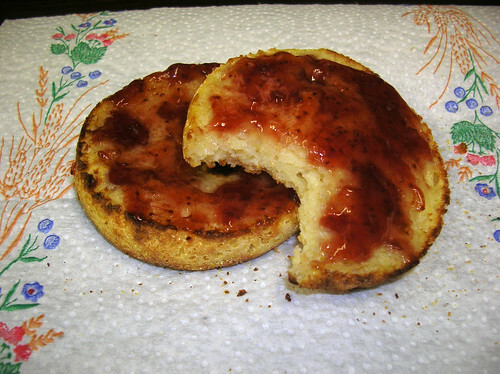 I bought these Glutino English Muffins a couple weeks ago and forgot to blog about them. They are great, they toast up crispy on the outside, soft on the inside with plenty of nooks and crannies. I love them best with butter and jelly (earth balance and nature's promise strawberry). I've determined that it's not the taste of GF breads that turn me off, it's the smell while they're cooking. When I'm toasting one of these I need to stay out of the kitchen because I think it stinks but then eating them is no problem! Strange, I know. I am sitting here at work, bored out of my mind with nothing to do but haven't received the green light to go home yet. It will be soon. My recipes are printed out, I do have to go pick up a few items at Stop & Shop that I've forgotten, but then it's off to the kitchen to bake and cook the day away! I can't wait. I'm making stuffing, pumpkin chocolate chip bars and maybe coffee cake muffins. We'll see how ambitious I feel this afternoon. It's going to be a challenge to avoid eating all of the stuffing tonight!! I looooooooove stuffing and I hope my new version made with waffles will come out ok. I am going to stop at Whole Foods on my way home to see if they have any GF apple pies left and if so, then I will pick one up. I hope you all have a wonderful gluten-free Thanksgiving!! Can't wait to see all the re-caps! I just bought some yesterday and tried them this morning. I thought they were great too! Mmmm I love English muffins! I like mine with jelly or nut butter + fresh fruit. Those Glutino muffins are good, aren't they? I ended up making cornbread stuffing and it came out great. That was the only thing I was worried about adapting to GF. Made a tasty, but too sweet, GF pie crust too. Yum, leftovers. I can't wait for turkey!!! I love me some dairy free chocolate! What a nice way to start my week.